SEOUL - South Korean prosecutors on Tuesday demanded a 30-year-jail sentence for former President Park Geun-hye, sacked over a wide-ranging corruption scandal which exposed shady links between big business and politics and prompted massive street protests. The 66-year-old daughter of a former dictator was dismissed in March 2017 and has now been in custody for almost a year. "We ask the court to hand down 30 years in prison and (a fine of) 118.5 billion won ($110 million) for the accused, who must take ultimate responsibility for the scandal as the 18th president of this country," prosecutors said in a statement. They said Park, in collusion with her secret confidante and long-time friend Choi Soon-sil, took or was promised bribes totalling 59.2 billion won ($52 million) from three South Korean companies, Samsung, Lotte and SK, in return for policy favors. Park has also been charged with coercing 18 large firms to "donate" a total of 77.4 billion won to two dubious foundations controlled by Choi. The Seoul Central District Court earlier this month found Choi guilty of abuse of power, bribery and interfering in government business and sentenced her to 20 years in prison. 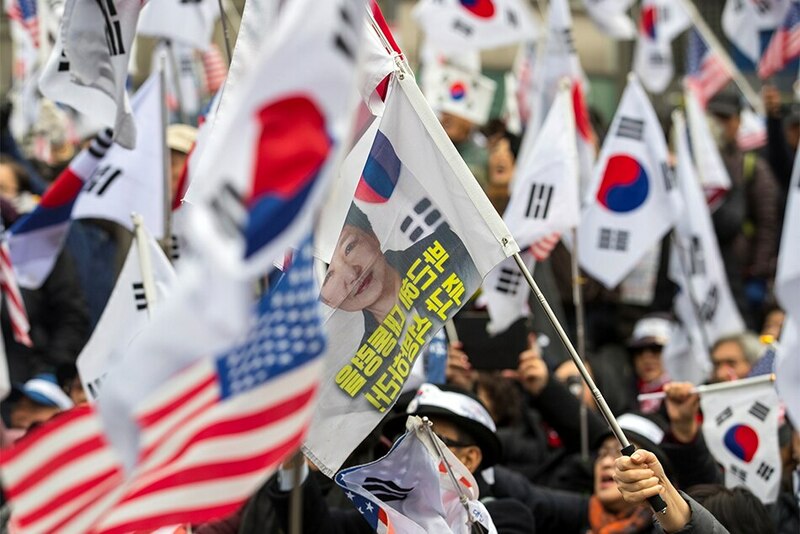 The verdict and sentence were seen as a potential pointer to the decision in Park's separate trial in the same court because 15 of the 18 charges Choi faced mirror charges against the ex-president. A date for the verdict on Park may be announced at the end of Tuesday's session. "The accused (Park) abused her power delegated by the people for private gain for Choi and herself... violated core constitutional values on the protection of the market economy and free democracy," the statement said. "Consequently, the accused became the first president to be sacked through impeachment, leaving an indelible scar on the country's constitutional history." The prosecutors also rebuked Park for "allying with the chaebol instead of the people", in reference to the country's family-controlled large conglomerates, accusing her of strengthening "unhealthy ties between political power and economic power." They also decried her attitude toward justice. When allegations about Choi's misdeeds started surfacing in news media, Park tried to mislead public opinion and denounced the reports as "political offensives," prosecutors said. "When the court issued an arrest warrant for the accused Park, she tried to cover up the true picture of the case by describing the move as political revenge." Park since October has stopped attending the court, which she denounces as politically biased. Some legal experts believe she is in an even worse position than Choi was, noting that the judge who sentenced Choi had denounced Park for having "delegated" presidential authority to a private individual. Park, daughter of late dictator Park Chung-Hee, was brought up in Seoul's presidential Blue House. The scandal sent her once bulletproof approval ratings to record lows, with tens of thousands taking to the streets for months calling for her ousting. But she retained a loyal following from groups of mainly older rival protesters. Her downfall gave the left-leaning Democratic Party the upper hand in the presidential election last May, which was easily won by Moon Jae-in. Approval ratings for Moon remain high, mainly due to his down-to-earth image, pro-poor policies and the pursuit of dialogue with North Korea, as well as the success of the just-ended Pyeongchang Winter Olympics.